Efficient, positive jig that eliminates the stoop-squint, slant-slope, tilt-tip method of trying to be sure that a tap is square in the hole. Works equally well on flat or round surfaces. On tapered barrels, the milled "V" can be shimmed to ensure true tap entry. Handles all tap sizes from 3/8" to 0-80, except No. 12 and No. 14. 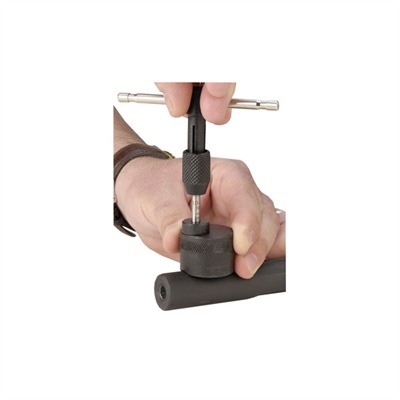 Wood block holds bushing assortment and has holes for regularly used taps. SPECS: Blued steel. Taps and tap wrench NOT included.